Far, far away, 130 million years ago, in a galaxy nestled in the Hydra constellation, a violent explosion of two collapsed stars merging into one sent a burst of gamma rays searing across the cosmos and sent shockwaves through the fabric of the universe. It has also sent shockwaves of excitement through the field of astrophysics, demonstrating a new way to study the heavens. It took until August 17 for these signals to reach Earth, where, at 8:41 a.m. Eastern time, a team of gravitational wave astronomers observed them with the LIGO and Virgo detectors. Less than two seconds later, NASA's Fermi Space Telescope observed a quick flash of gamma radiation, long theorized to be associated with merging neutron stars. The LIGO and Virgo team was able to pinpoint where the signals were coming from and put dozens of observatories around the globe on alert to look for signals of cosmic upheaval. In his office at University of California, Santa Cruz, postdoctoral researcher Charles Kilpatrick was the first to locate it. Scanning images from his team's telescope in Chile, he saw -- beside a galaxy known as NGC 4993 -- a tiny dot that had not been there before. Kilpatrick will enter the history books as the first known human to see photons from a neutron star collision. Speaking to the California Report's John Sepulvado, Kilpatrick says it looked like any other star at first. Further analysis revealed it was kind of blue. "If something is blue, it's really hot," he says. The spectacular heat seen from these kinds of collisions create conditions for a kind of "cosmic forge" which have profoundly influenced the chemistry and evolution of the universe. It's been long believed that collisions between neutron stars are the primary sources of heavy elements, such as gold, silver and platinum. But prior to this event, no neutron star collision had been observed. Imagine this the next time you offer a loved one a ring, necklace or bracelet made from a precious metal — you are offering them the offspring of the union between two really dense dead stars. And just as gold and platinum are incredibly rare, so are these events. "This detection has genuinely opened the doors to a new way of doing astrophysics. 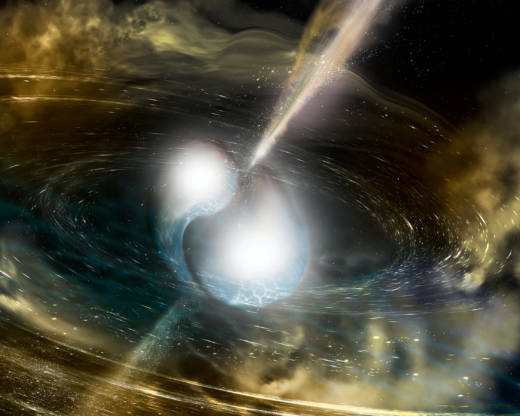 I expect it will be remembered as one of the most studied astrophysical events in history," said Laura Cadonati, professor of physics at Georgia Tech and deputy spokesperson for the LIGO Scientific Collaboration in a statement. Prior to this collision, astronomers have observed distant cosmic events through just a single channel of information: gamma ray bursts, or radio signals, for example. The inclusion of gravitational waves (a new technique) and direct telescope observation (an old one) is like having several messengers tell you about the same thing. David Reitze, executive director of the LIGO observatory compares it to movies making the leap from silent films to 'talkies'. This is the fifth source of gravitational waves to be detected — the first one was discovered in September 2015, for which three founding members of the LIGO collaboration were awarded the Nobel prize in physics two weeks ago.